*HOT* Shoe Carnival Coupons $10 off & $20 off! Wow! 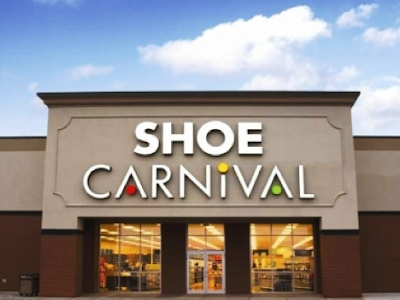 These are great coupons…right now you can print these 2 coupons for Shoe Carnival! $10 off $59.98 or more! Hurry and print them while they’re still available! New Coupons! Glade, Scrubbing Bubbles, Listerine, Nestle, Whiskas & MORE! *HOT* Cesar Canine Cuisine Coupon = $0.06 at Kroger! (Consider Donating)! 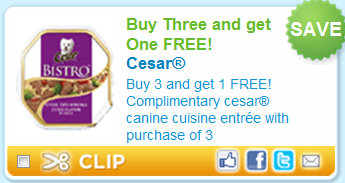 Coupons.com just released a HOT new coupon for Buy 3 Cesar Canine Cuisine Entrees, Get 1 FREE! You can get these for JUST $0.06 this week at Kroger as part of the Mega Sale! Final cost is $0.06 each! (You can do this twice…so buy 8 because you can hit back and refresh and print two of these coupons) If you have another computer, you can print more! You can donate these to an Animal Shelter if you don’t have a doggy! 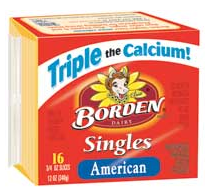 Borden Cheese PDF Coupon = $0.88 cheese at Wal Mart! You can get a sweet coupon for Borden Cheese! Go here to their Facebook page and “Like” them and then click here to print a PDF coupon for $1 off ANY package of Borden Cheese! I’ve seen this at Wal Mart for $1.88 so after the coupon it would be just $0.88! Let us know if you knof of any other good deals on this cheese. *Remember, since it’s a PDF coupon, you can print multiples! New High-Value Coupons! 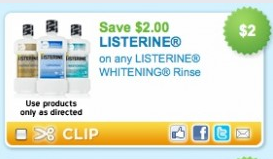 Listerine, Wonka, Nestle, and more! Yippee! 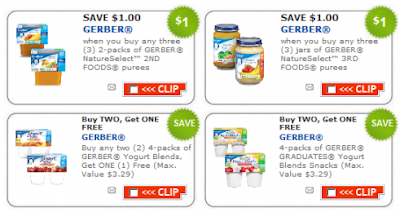 I can’t even remember the last time Coupons.com had Gerber Baby Food coupons. If you have a little one, you’re sure to be buying these products regardless of a sale so that’s why I highly recommend printing these! *HOT* AMF $20 Coupon is Back! Yay, it’s back again! AMF Bowling is offering up a limited quantity of these *HOT* coupons for $20 off your next game of bowling for 4 or more people AGAIN! GO HERE to print it! 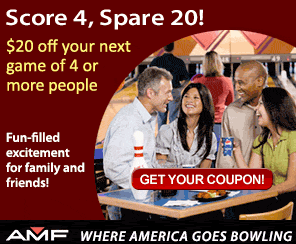 *These high value AMF bowling coupons are usually not available for long, so I suggest printing this coupon while you can! New Printable Coupons! (Coupon Reset)!